Recognized for its distinctive musical features and its connection to periods of social innovation and ferment, the genre of psychedelia has exerted long-term influence in many areas of cultural production, including music, visual art, graphic design, film, and literature. William Echard explores the historical development of psychedelic music and its various stylistic incarnations as a genre unique for its fusion of rock, soul, funk, folk, and electronic music. Through the theory of musical topics-highly conventional musical figures that signify broad cultural concepts-and musical meaning, Echard traces the stylistic evolution of psychedelia from its inception in the early 1960s, with the Beatles' Rubber Soul and Revolver and the Kinks and Pink Floyd, to the German experimental bands and psychedelic funk of the 1970s, with a special emphasis on Parliament/Funkadelic. He concludes with a look at the 1980s and early 1990s, touching on the free festival scene, rave culture, and neo-jam bands. 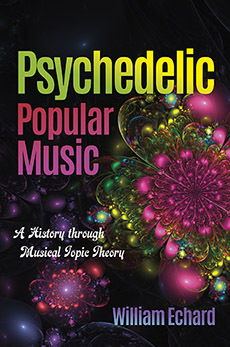 Set against the cultural backdrop of these decades, Echard's study of psychedelia lays the groundwork and offers lessons for analyzing the topic of popular music in the twentieth and twenty-first centuries. Echard, W.B. (2017). Psychedelic popular music: A history through musical topic theory. Musical Meaning and Interpretation. Indiana University Press.